(Nanowerk News) For all their promise, solar cells have frustrated scientists in one crucial regard -- most are rigid. They must be deployed in stiff, often heavy, fixed panels, limiting their applications. So researchers have been trying to get photovoltaics to loosen up. The ideal: flexible, decal-like solar panels that can be peeled off like band-aids and stuck to virtually any surface, from papers to window panes. Now the ideal is real. Stanford researchers have succeeded in developing the world's first peel-and-stick thin-film solar cells. The breakthrough is described in a paper in the December 20th issue of Scientific Reports ("Peel-and-Stick: Fabricating Thin Film Solar Cell on Universal Substrates"; open access). 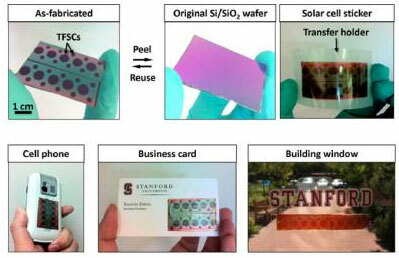 Unlike standard thin-film solar cells, the peel-and-stick version from Stanford does not require any direct fabrication on the final carrier substrate. This is a far more dramatic development than it may initially seem. All the challenges associated with putting solar cells on unconventional materials are avoided with the new process, vastly expanding the potential applications of solar technology. This shows demonstrations of the peel-and-stick thin-film solar process and various applications. Thin-film photovoltaic cells are traditionally fixed on rigid silicon and glass substrates, greatly limiting their uses, says Chi Hwan Lee, lead author of the paper and a PhD candidate in mechanical engineering. And while the development of thin-film solar cells promised to inject some flexibility into the technology, explains Xiaolin Zheng, a Stanford assistant professor of mechanical engineering and senior author of the paper, scientists found that use of alternative substrates was problematic in the extreme. "Nonconventional or 'universal' substrates are difficult to use for photovoltaics because they typically have irregular surfaces and they don't do well with the thermal and chemical processing necessary to produce today's solar cells," Zheng observes. "We got around these problems by developing this peel-and-stick process, which gives thin-film solar cells flexibility and attachment potential we've never seen before, and also reduces their general cost and weight." Utilizing the process, Zheng continues, researchers attached their solar cells to paper, plastic and window glass among other materials. "It's significant that we didn't lose any of the original cell efficiency," Zheng said. The new process involves a unique silicon, silicon dioxide and metal "sandwich." First, a 300-nanometer film of nickel (Ni) is deposited on a silicon/silicon dioxide (Si/SiO2) wafer. Thin-film solar cells are then deposited on the nickel layer utilizing standard fabrication techniques, and covered with a layer of protective polymer. A thermal release tape is then attached to the top of the thin-film solar cells to augment their transfer off of the production wafer and onto a new substrate. The solar cell is now ready to peel from the wafer. To remove it, the wafer is submerged in water at room temperature and the edge of the thermal release tape is peeled back slightly, allowing water to seep into and penetrate between the nickel and silicon dioxide interface. The solar cell is thus freed from the hard substrate but still attached to the thermal release tape. Zheng and team then heat the tape and solar cell to 90°C for several seconds, then the cell can be applied to virtually any surface using double-sided tape or other adhesive. Finally, the thermal release tape is removed, leaving just the solar cell attached to the chosen substrate. This is a process developed for peel-and-stick thin-film solar cells. Tests have demonstrated that the peel-and-stick process reliably leaves the thin-film solar cells wholly intact and functional, Zheng said. "There's also no waste. The silicon wafer is typically undamaged and clean after removal of the solar cells, and can be reused." While others have been successful in fabricating thin-film solar cells on flexible substrates before, those efforts have required modifications of existing processes or materials, noted Lee. "The main contribution of our work is we have done so without modifying any existing processes, facilities or materials, making them viable commercially. And we have demonstrated our process on a more diverse array of substrates than ever before," Lee said. "Now you can put them on helmets, cell phones, convex windows, portable electronic devices, curved roofs, clothing -- virtually anything," said Zheng. Moreover, peel-and-stick technology isn't necessarily restricted to thin-film solar cells, Zheng said. The researchers believe the process can also be applied to thin-film electronics, including printed circuits and ultra thin transistors and LCDs. "Obviously, a lot of new products -- from 'smart' clothing to new aerospace systems -- might be possible by combining both thin-film electronics and thin-film solar cells," observed Zheng. "And for that matter, we may be just at the beginning of this technology. The peel-and-stick qualities we're researching probably aren't restricted to Ni/SiO2. It's likely many other material interfaces demonstrate similar qualities, and they may have certain advantages for specific applications. We have a lot left to investigate."